In Wizard of Oz, Dorothy, the main character, wears ruby slippers. Dominic Wilcox, a designer in the United Kingdom, was inspired by these ruby slippers. As a result, he invented navigating shoes for people with no sense of direction. He placed Global Positioning System(GPS) to these shoes, and therefore, if the wearer goes the wrong way, the shoes begin to vibrateto alarm the wearer. As the distance between user and destination narrows, lights on the shoes get brighter. In this way, people without a good sense of the direction can expect to arrive at their destination on time. This project coined “No Place Like Home,” was launched by Dominic Wilcox and has taken off successfully. Tractica, the American digital marketing research institute, expects the sales of this wearable device to increase from 18 million in 2014 to 50 million in 2015. A lot of companies from small venture to large conglomerates such as Samsung or Apple have been researching on wearable devices, and have already launched products such as Smart Band or Apple Watch. 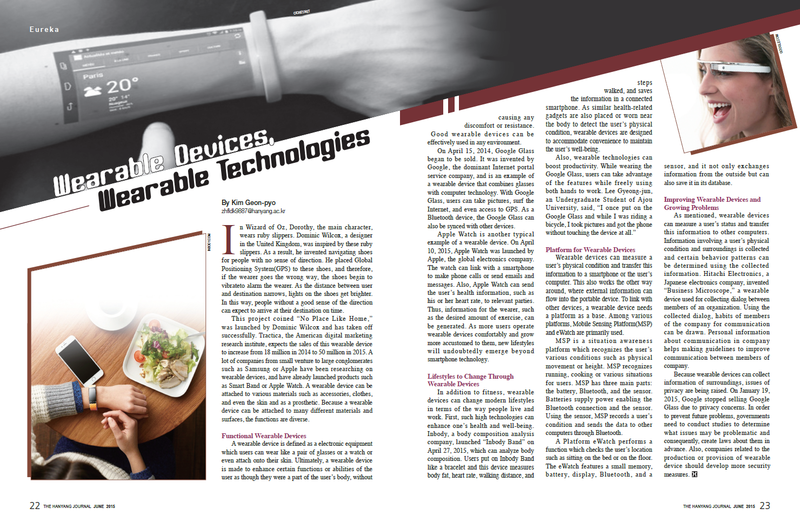 A wearable device can be attached to various materials such as accessories, clothes, and even the skin and as a prosthetic. Because a wearable device can be attached to many different materials and surfaces, the functions are diverse. A wearable device is defined as a electronic equipment which users can wear like a pair of glasses or a watch or even attach onto their skin. Ultimately, a wearable device is made to enhance certain functions or abilities of the user as though they were a part of the user’s body, without causing any discomfort or resistance. Good wearable devices can be effectively used in any environment. On April 15, 2014, Google Glass began to be sold. It was invented by Google, the dominant Internet portal service company, and is an example of a wearable device that combines glasses with computer technology. With Google Glass, users can take pictures, surf the Internet, and even access to GPS. As a Bluetooth device, the Google Glass can also be synced with other devices. Apple Watch is another typical example of a wearable device. On April 10, 2015, Apple Watch was launched by Apple, the global electronics company. The watch can link with a smartphone to make phone calls or send emails and messages. Also, Apple Watch can send the user’s health information, such as his or her heart rate, to relevant parties. Thus, information for the wearer, such as the desired amount of exercise, can be generated. As more users operate wearable devices comfortably and grow more accustomed to them, new lifestyles will undoubtedly emerge beyond smartphone technology. Wearable devices can measure a user’s physical condition and transfer this information to a smartphone or the user’s computer. This also works the other way around, where external information can flow into the portable device. To link with other devices, a wearable device needs a platform as a base. Among various platforms, Mobile Sensing Platform(MSP) and eWatch are primarily used. MSP is a situation awareness platform which recognizes the user’s various conditions such as physical movement or height. MSP recognizes running, cooking or various situations for users. MSP has three main parts: the battery, Bluetooth, and the sensor. Batteries supply power enabling the Bluetooth connection and the sensor. Using the sensor, MSP records a user’s condition and sends the data to other computers through Bluetooth. A Platform eWatch performs a function which checks the user’s location such as sitting on the bed or on the floor. The eWatch features a small memory, battery, display, Bluetooth, and a sensor, and it not only exchanges information from the outside but can also save it in its database. As mentioned, wearable devices can measure a user’s status and transfer this information to other computers. Information involving a user’s physical condition and surroundings is collected and certain behavior patterns can be determined using the collected information. Hitachi Electronics, a Japanese electronics company, invented “Business Microscope,” a wearable device used for collecting dialog between members of an organization. Using the collected dialog, habits of members of the company for communication can be drawn. Personal information about communication in company helps making guidelines to improve communication between members of company. Because wearable devices can collect information of surroundings, issues of privacy are being raised. On January 19, 2015, Google stopped selling Google Glass due to privacy concerns. In order to prevent future problems, governments need to conduct studies to determine what issues may be problematic and consequently, create laws about them in advance. Also, companies related to the production or provision of wearable device should develop more security measures.